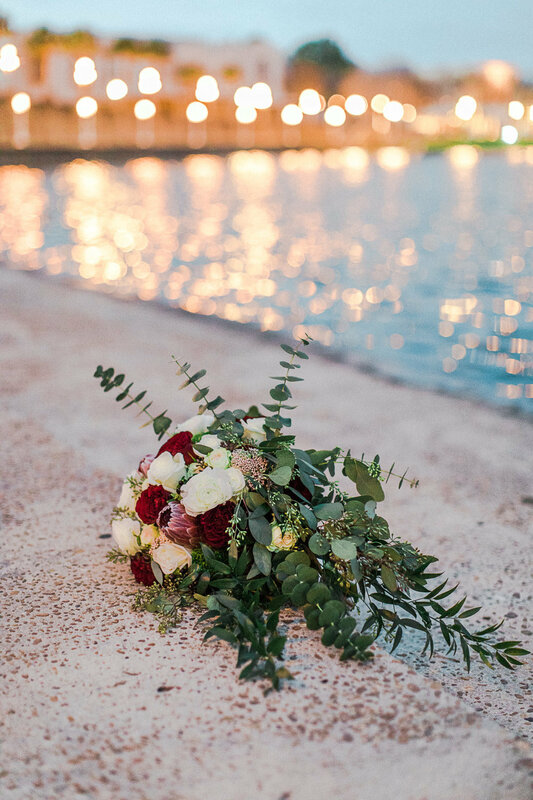 With harmonious tension, rich tones and elegance, moody + whimsical dance, creating a romantically mysterious, yet bright atmosphere, highlighting the intimacy of the wedding day. “The Terrace Romance" hosted at the historic boutique Terrace Hotel is a collaboration of Tampa Bay area vendors and models, along with Jeff & Michele, who traveled from Louisville, Ky desiring to create something different, exotic, with plenty of diversity, and yet not too edgy to be perceived as unbecomingly foreign to the current styles. 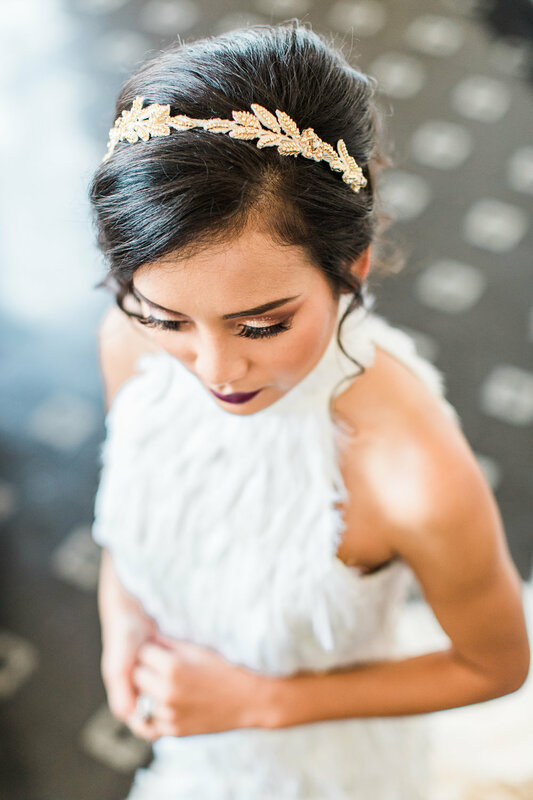 Wearing an opulent and whimsically glamorous ostrich plume feather dress, our bride, accompanied by a lovely cascading bouquet adorned with red roses and unopened protea, perfectly fits the exotic and romantic air. 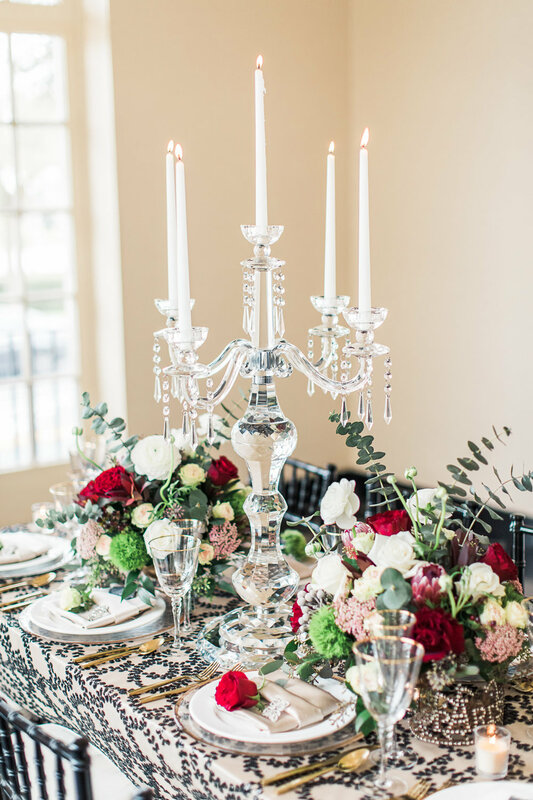 A passionate color scheme of red, cream, and gold with burgundy and blush accents adorn the shoot, adding to the charmingly mysterious allure. 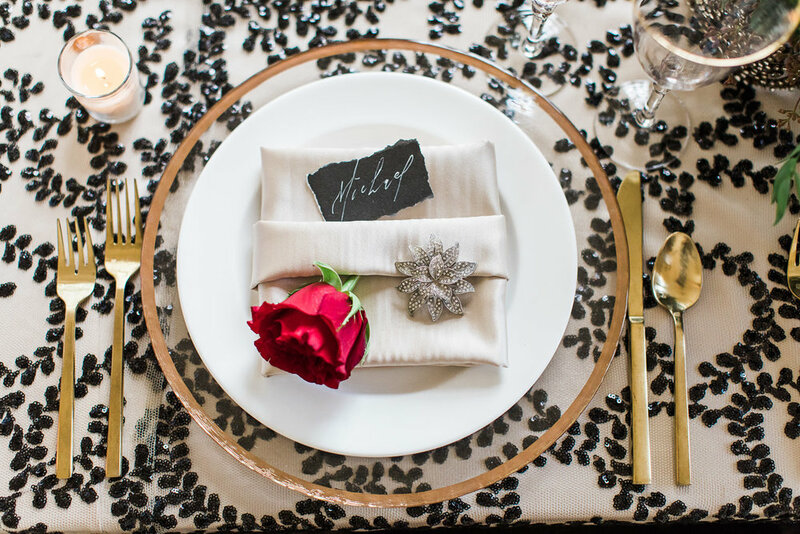 An elegantly embellished table is set with a gorgeously textured cream and black linen, lush centerpieces featuring young proteas, gold rimmed chargers and glassware, and gold flatware, all complementing the classy charm and balancing the sultry mood. 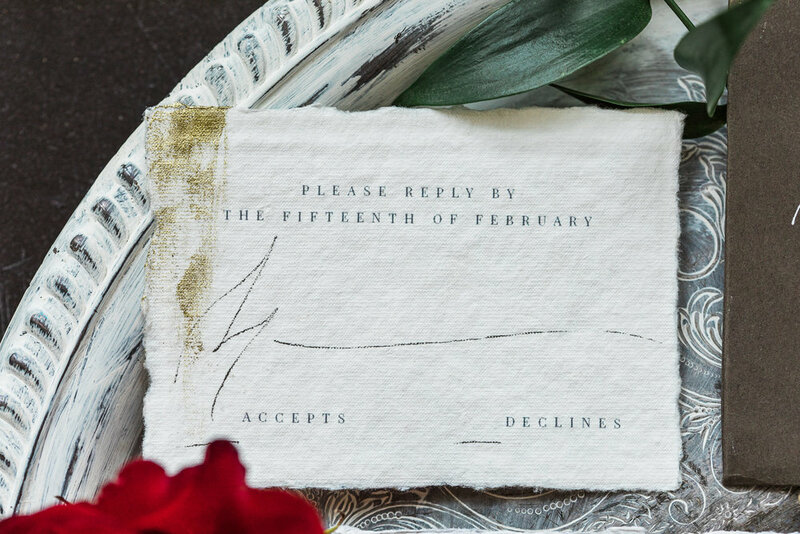 With hand-torn edges, gold accents, intriguing hand-lettering, and a beautiful illustration of The Terrace Hotel, Script + Vine’s paper suite adds a captivating and enchantingly mature touch to the event. The gold metallic finished and marbled fondant three-tiered cake featuring a luscious hand-crafted candy peony from Hands on Sweets sits upon a marbled base, perfectly adding to the curious allure. The particularly delicious cake pops are masterfully accented with 24kt gold foil, creating yet another wisp of glamor, echoed by the dainty sugar cookies which sport a brushed gold stripe. 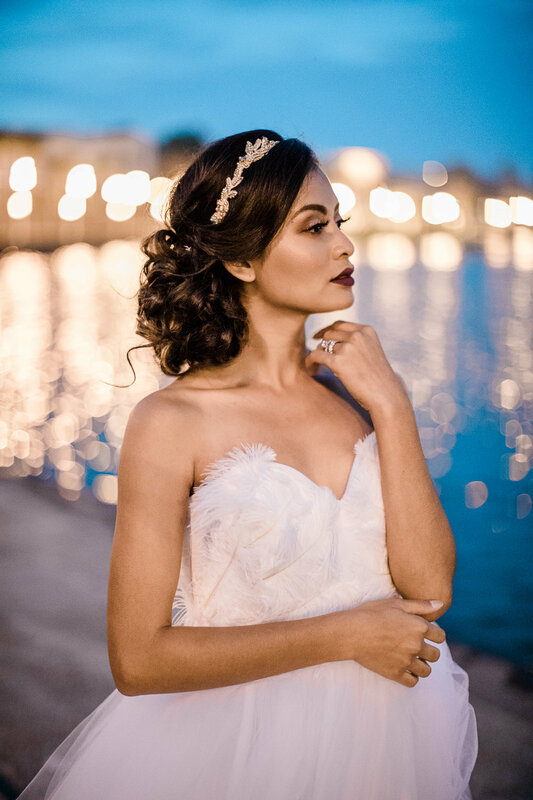 To complete the evening, we find our bride beside The Terrace’s Lake Mirror in an illustrious tulle Ostrich-plume dress which is so unique and gorgeous, as well as a more relaxed and whimsical take on the first feather-dress. We conclude here on a playful and fun note, as our bride mingles with her groom who is now charmingly dressed in a dapper berry suit.